Easter is such a fun time of the year. It brings out the joy in children and tells us all that spring is just around the corner. These lemon cupcakes with grass frosting are sure to be the hit of any Easter gathering that you hold this year. This shop has been compensated by Collective Bias, Inc. and its advertiser. All opinions are mine alone. 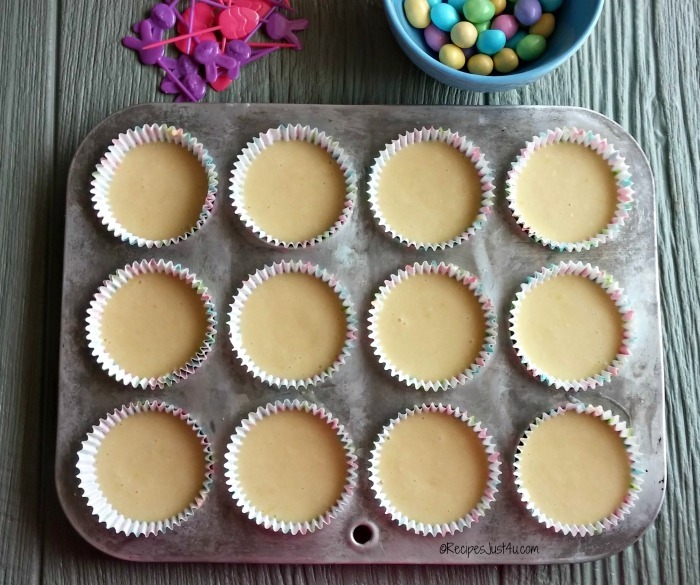 #SweeterEaster #CollectiveBias It’s time for a lemon cupcake recipe! These Easter cupcakes have a delightful lemon flavoring. We love lemon desserts in our house, so these are going to disappear quickly. Normally I would make a lemon buttercream frosting to top them with. But since Easter will soon be here, I decided to go all out and attempt to do grass frosting instead. I am, by no means a cake decorator, but this frosting for lemon cupcakes turned an ordinary dessert into something really special for my Easter dessert table. 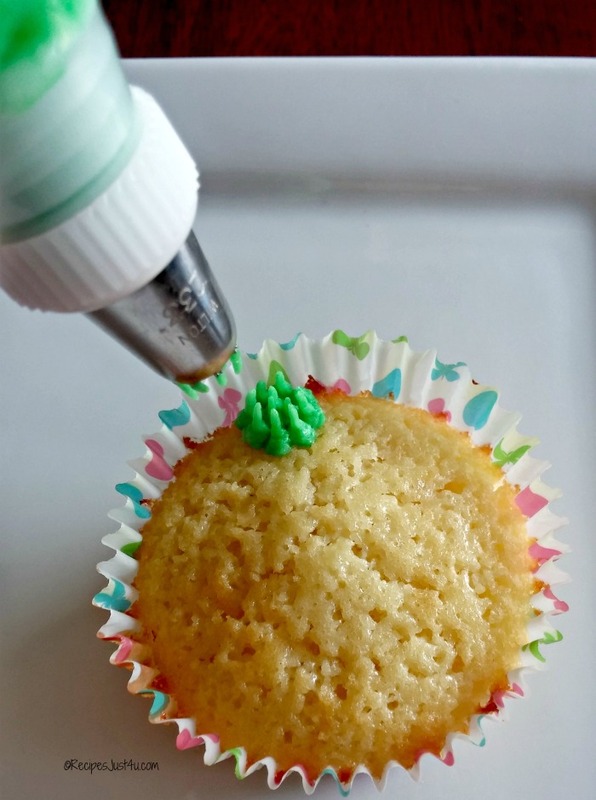 These easy lemon cupcakes are filled with everything that makes a dessert taste so good. I used cake flour for this recipe. 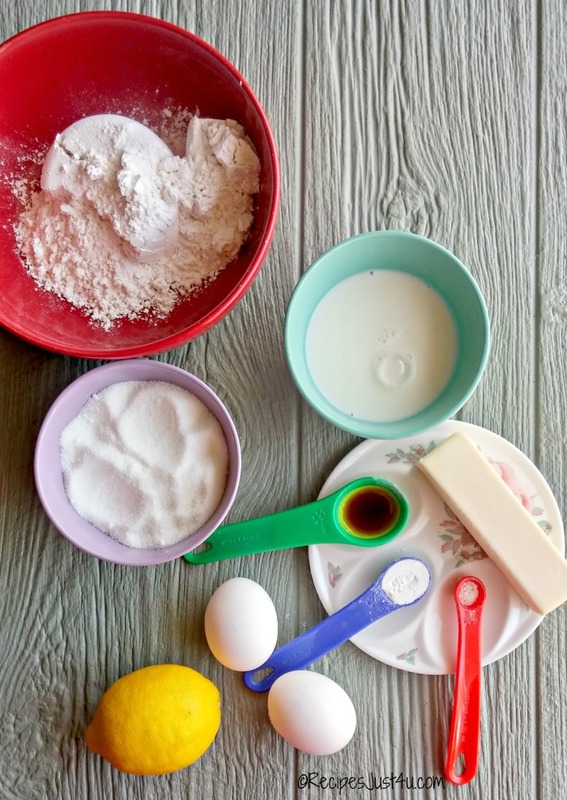 Cake flour is a completely different ingredient than the all-purpose flour we use to make things like breads and cookies. It has a lower protein content and is also ground much more finely than other flours, giving it a soft and silky feel. That soft and silky feel makes for a really great textured cupcake. I filled my muffin cups to about 1/2″ from the top of the liner. The lemon cupcake icing will be the feature of this dessert, so you don’t want them to be baked up too high. When my daughter was a little girl, I made all sorts of fancy decorated cakes. I actually got to be pretty good with pastry bags and icing tips, but it’s been years since I attempted anything other than a few stars here and there. So, when I say that, right now, I am a novice with decorating tips, you can believe me. 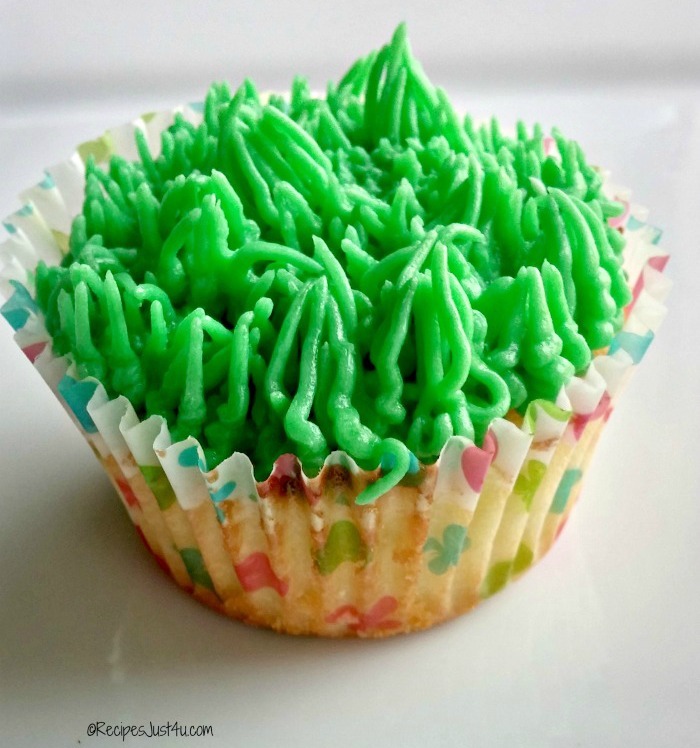 Even so, decorating Easter cupcakes with this grass effect for the frosting is pretty easy to do with the right tools. Be sure your cupcakes are completely cooled. If you try to frost them too soon, you’ll end up with wilted grass and the effect won’t be the same. To get my color right, I used a gel food coloring to color the icing. Sometimes, the liquid ones will thin out your recipe and it’s hard to determine how much to use to get the right color. Gel food colorings usually have a corn syrup and/or glycerin base and a much more intense color than regular food colors. You can use much less to get the same (or a better color). They also come in lots of colors so you don’t have to combine blue and yellow to make green, etc. I used just two drops to get my green color. I also used the icing tip #233 for this project. It has a lot of serrated holes cut into the end of it and makes the job of creating the grass an easy one. You CAN use a single hole tip and pull up each strand one at a time, but I have other things to do today as well as making the icing grass, so I am doing it the easier way! Cut a hole in the icing bag and insert the icing tip #233, then add a coupler to hold it in place. 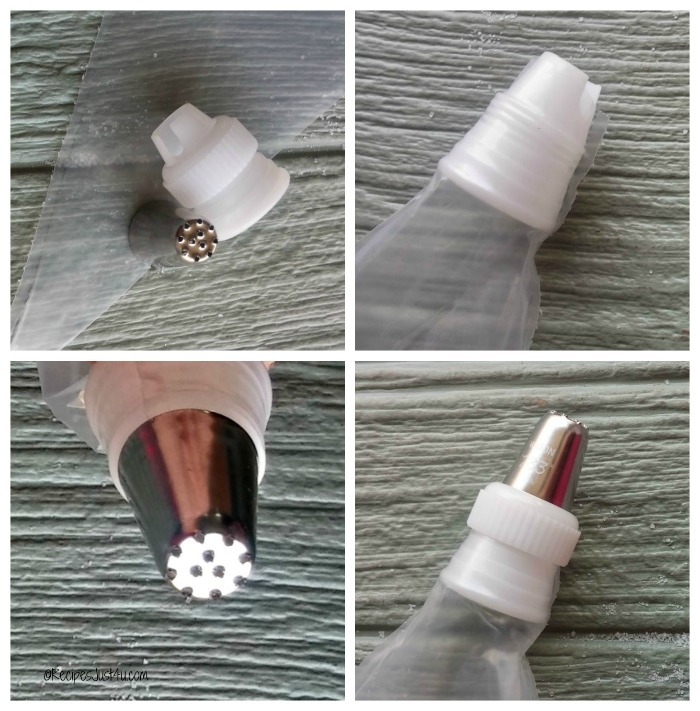 This is not an absolutely crucial step, but I find that using the coupler keeps the tip in place and it can be reused over and over so it’s not a big investment to keep some on hand. Fill fill the icing bag about 1/2 full. Be sure the butter cream icing has a medium consistency so that the grass will stand up well. If it is too soft, just add more confectioner’s sugar. This was my consistency before I added the coloring. Hold the bag at a 90º angle (straight up) and hold the tip just above the surface of the cupcake. Start by squeezing the bag and pulling up. Squeeze the bag firmly to form grass strands. Just pull up and away from the cupcake until the icing strands are about 1/2″ long. Then stop the pressure and pull the tip away. The strand will form from this action. See how it’s starting to look just like grass? 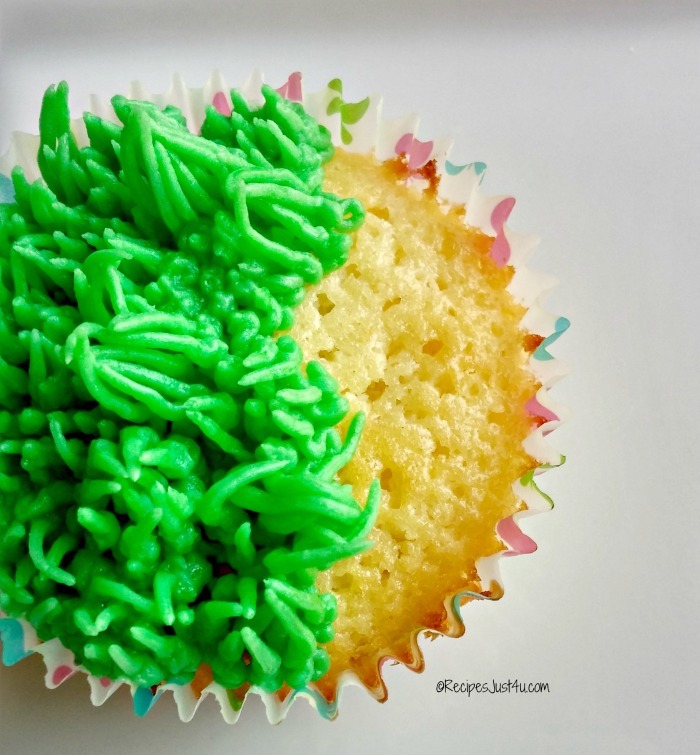 Continue adding more grass clusters, keeping them close together so that none of the cupcake shows through the icing. For a more natural look, you can occasionally pull the tip slightly to the right or left, instead of just straight up, since that is the way real grass grows. Continue doing this until the top of the cupcake is completely covered. It is really quite easy to do. This is the first time I have tried this and this cupcake was my very first attempt! Let the buttercream frosting topping sit for a while to get a slightly stiff consistency, and then add a few M&M’s® Pastel Peanut in the grass for eggs. (I also used some normal M&M’s® from the MARS Spring Minis Mix bag.) Insert the Bunny and egg picks to decorate. At this stage, you will be just itching to eat one of these lemon cupcakes with grass frosting! 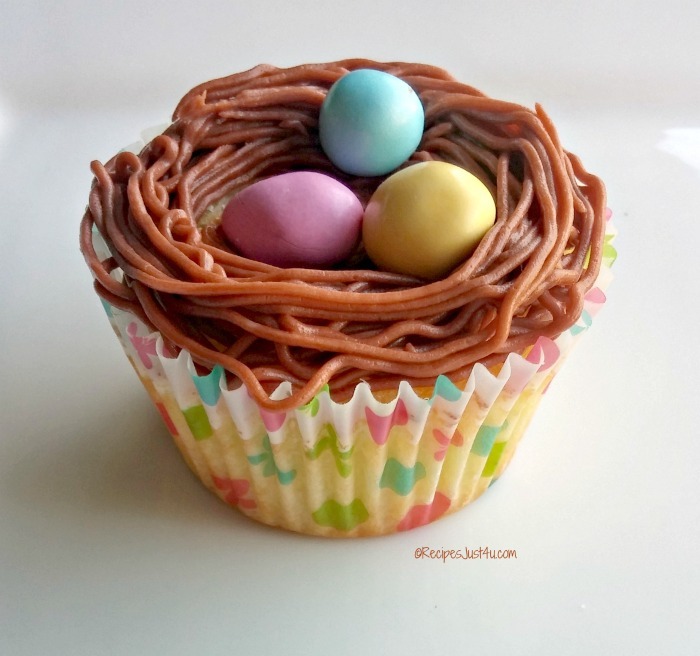 To make nests instead of grass, use the chocolate food gel coloring instead of the green to get a nest color. Cut the center out of the cupcake so that it has a hollow in it. Use the same #233 tip and make a large circle on the cupcake, filling in the center and then pull the tip slowly around the outside of the cupcake in a circle to make the edges taller to form a nest. Add the M&M’s® Pastel Peanut to the center of the nest. See the whole tutorial for the nest cupcakes here. 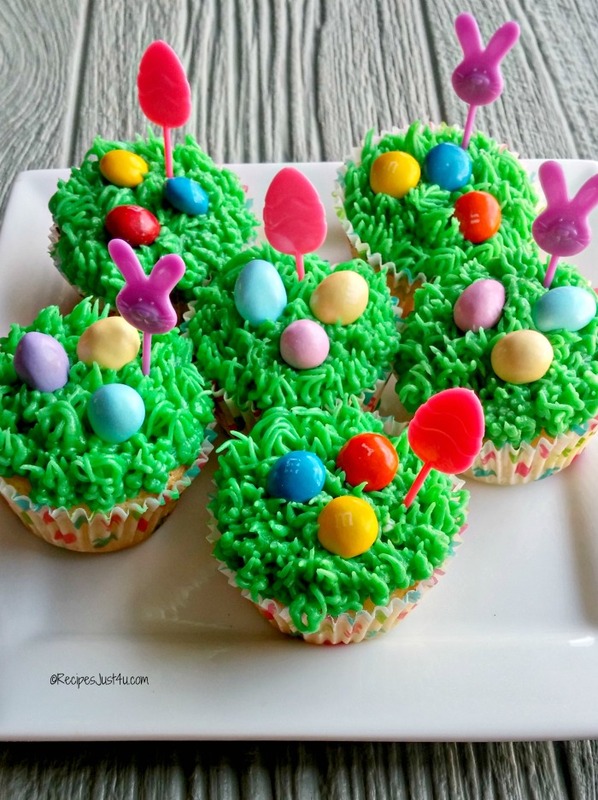 These cute Easter cupcakes will be the star on your holiday dessert table. They are so cute and taste delicious – so lemony and fresh. 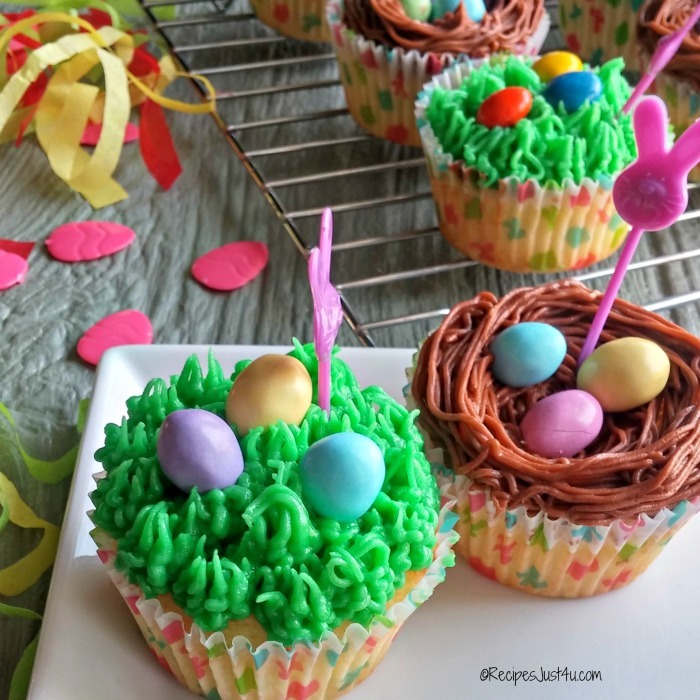 The M&M’s® Pastel Peanut add a wonderful bit of crunch to both the grass cupcakes and the nest cupcakes Would you like to make these lemon cupcakes with grass frosting for your family for Easter? Head to your local Sam’s club. 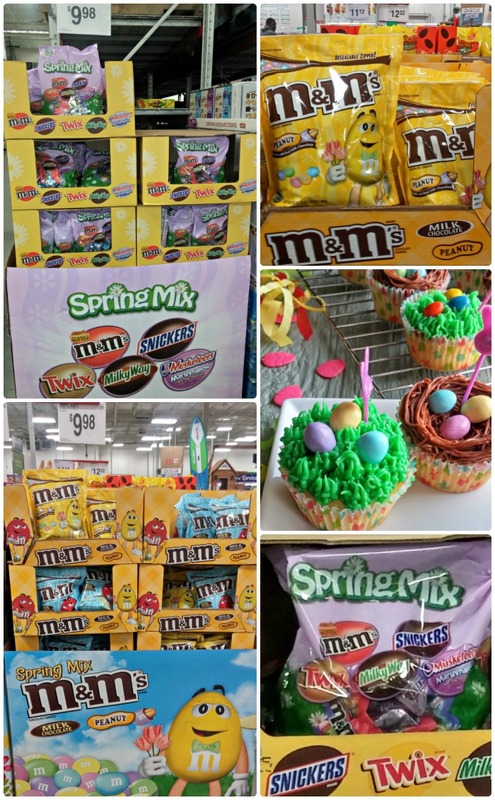 They have a great selection of M&M’s® Pastel Peanut as well as as a super bag of MARS Spring Minis Mix. They are perfect for your Easter Egg hunt, to fill those Easter baskets, or just to have around the house as the holiday approaches. 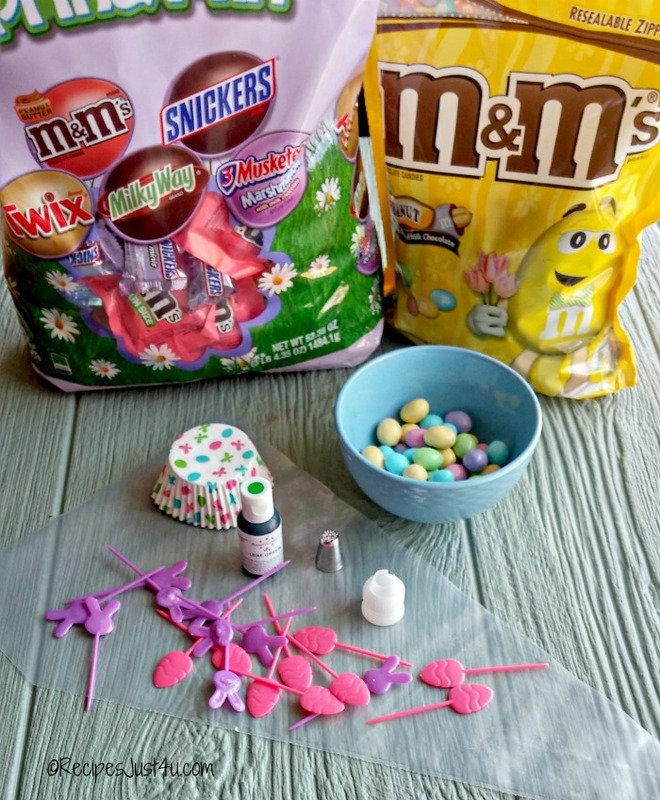 The larger bags of M&M’s® Pastel and MARS Spring Minis Mix from Sam’s Club are a wonderful help to make festive recipes, crafts, and decorations, for Easter and the price point is fabulous too! 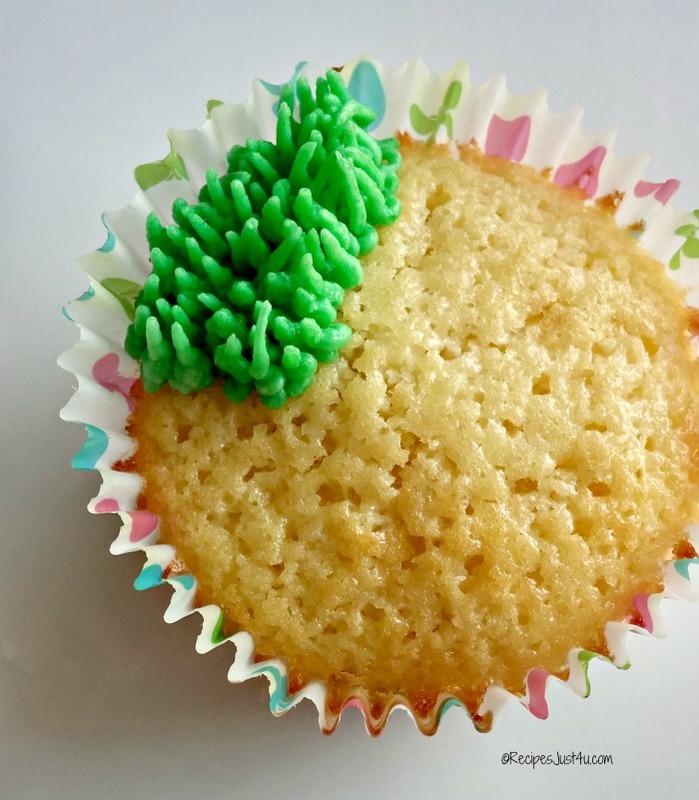 Imagine how your child’s teacher would love to have you bring these lemon cupcakes with grass frosting to school for an Easter class party or for a special Easter snack! What is your favorite Easter holiday dessert? Please share in the comments below. Do you love lemon as much as I do? Try these lemon poppy seed muffins for Easter morning too. 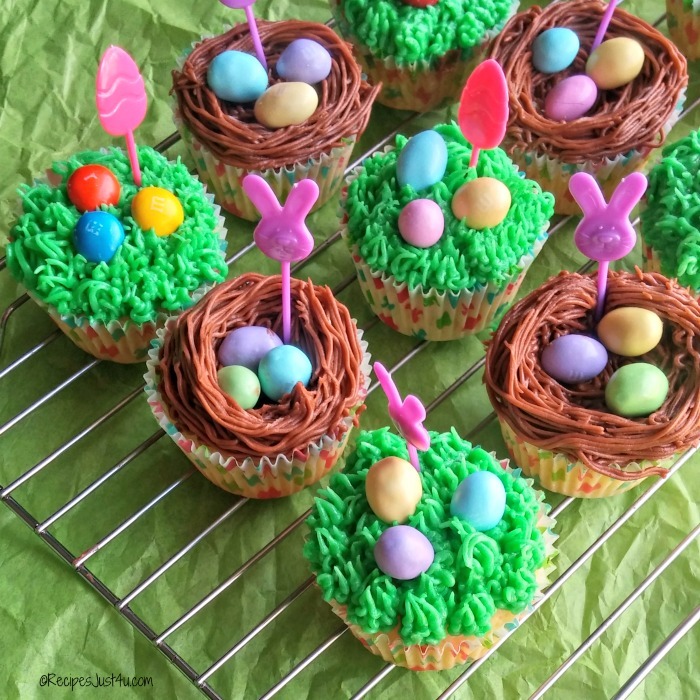 These sweet Easter cupcakes have a green grass frosting that is just perfect to sit Easter Eggs in. Preheat the oven to 350 F. Line 12 muffin tin cups with paper cupcake liners. In a medium sized bowl, combine the cake flour, baking powder, and salt.. Mix with a whisk, and set aside. 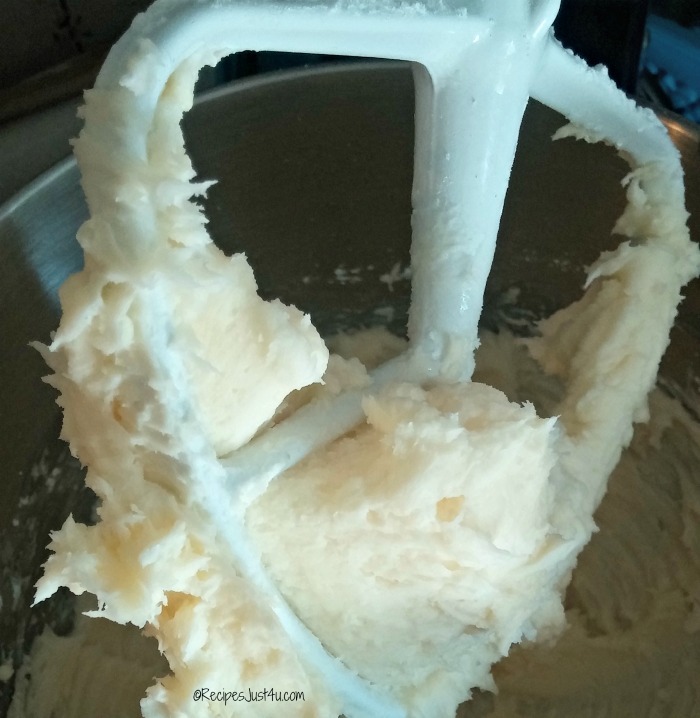 In a large bowl of a stand mixer, beat the butter and sugar on medium speed until well light and fluffy, about 2 minutes. Add the eggs one at a time, mixing until they are well blended into the batter and it looks creamy, about 1 minute. 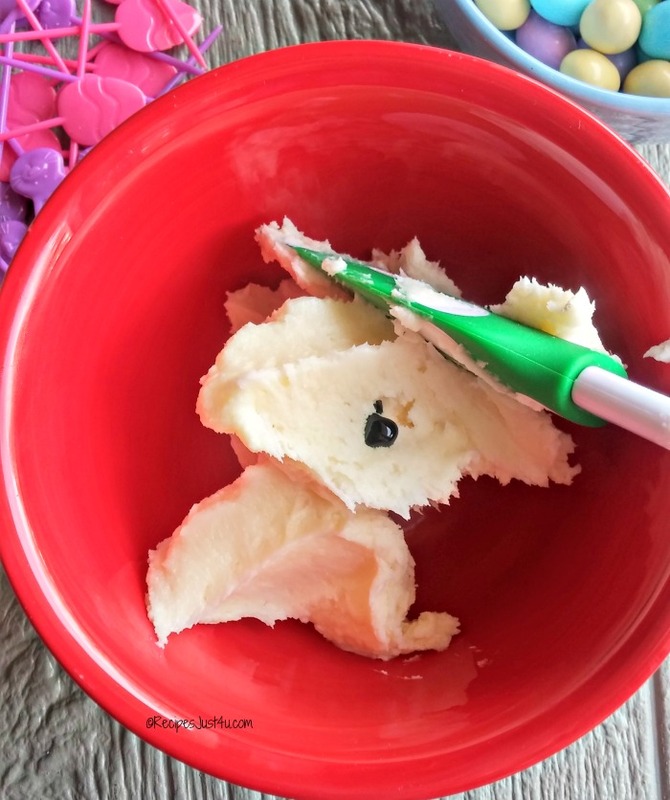 Add the lemon juice, lemon zest, and vanilla extract and beat for 2 minutes. Turn the mixer to low and add the dry ingredients and milk, alternating between each. Begin and end with the dry ingredients. 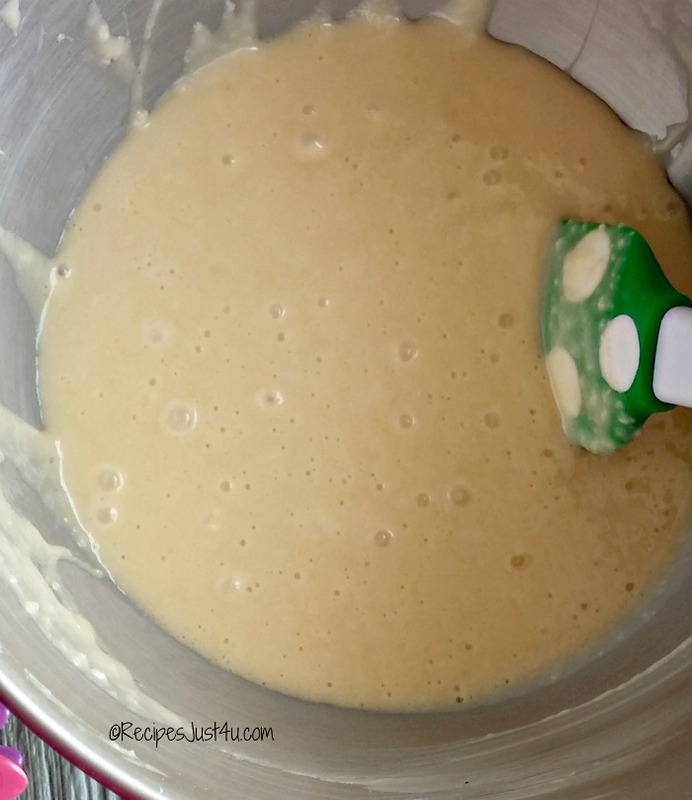 Mix just until the flour is incorporated and the batter looks smooth. Fill each cupcake liner to about 1/2 inch from the top of the liner. Bake just until the tops feel firm and a toothpick inserted in the center comes out clean, about 23-25 minutes. Place the cupcakes on a wire rack until completely cool. To make the icing, mix the butter until creamy. Add the confectioner's sugar a bit at a time. Stir in the vanilla extract and heavy cream. Add the green gel food coloring to get the color of grass. 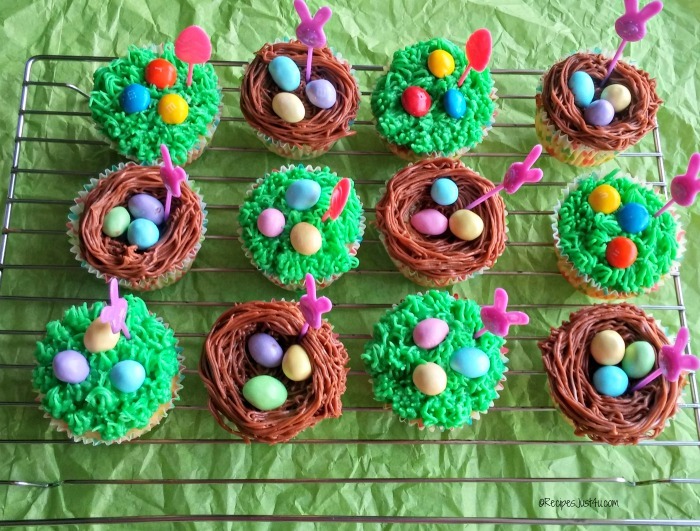 Optional: color 1/2 of the frosting green and add the gel chocolate color to the other half to make it the color of nests so that you can make nests instead of grass.